Washington, April 16 (IANS) US Senator Bernie Sanders has released a decade of tax returns, providing new insight into how the Democratic socialist from Vermont became a millionaire between his two presidential runs. According to the returns provided by his campaign on Monday, Sanders and wife Jane's bottom line jumped from $240,622 in 2015, the year he launched his first White House bid, to $1,073,333 a year later, as the once obscure lawmaker became a political sensation on the left and a bestselling author with royalties pouring in, CNN reported. Sanders in a statement on Monday said the returns "show that our family has been very fortunate". "I consider paying more in taxes as my income rose to be both an obligation and an investment in our country... I will continue to fight to make our tax system more progressive so that our country has the resources to guarantee the American Dream to all people," he added. 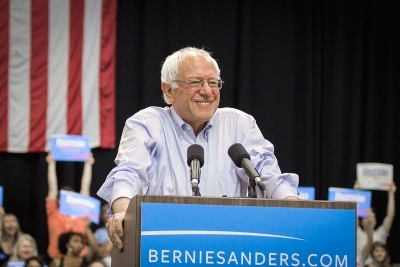 The records showed that Sanders' growing income and confirmed his status as a millionaire, largely on the strength of proceeds from book sales, including the bestselling "Where We Go From Here", published in 2018. Sanders reported a total 2018 family income of $566,421 -- $382,920 of which came from writing and royalties. The documents showed he paid $137,573 in federal taxes in 2018 and owed $8,267 in taxes for the year. Sanders last year made $110 in music royalties, presumably for his 1987 folk album, "We Shall Overcome", and an additional $1,810 from his 1997 memoir, "Outsider in the House". He was paid and additional $391,000 for his books. In 2016, during his first presidential campaign, Sanders released only one year of records -- from 2014. Sanders' tax returns comes a day after Democratic presidential candidate Senator Kamala Harris, who is of Indian and Jamaican descent, on Sunday released 15 years of her tax returns, showing that she and her husband earned almost $1.9 million in 2018.